The Candle Ranch Mason Jar Roughstock Candles Collection provides an awesome fragrant candle with a wonderful conversational piece. You will not find a more unique product than Roughstock Candles. Each candle label is created by an original painting by renown Cow Artist Denise Rich, her incredible detail and natural ability as an artist makes The Candle Ranch Candles complete. HOMER JOYs BAKERSFIELD SOUND Rose Vanilla Bayberry is a 3 layered red, white & blue candle with 3 different flavors for each layer. Each candle is one of a kind, no candle is exactly like another, however we guarantee our candle will be enjoyed by everyone that experiences a Candle Ranch Candle. 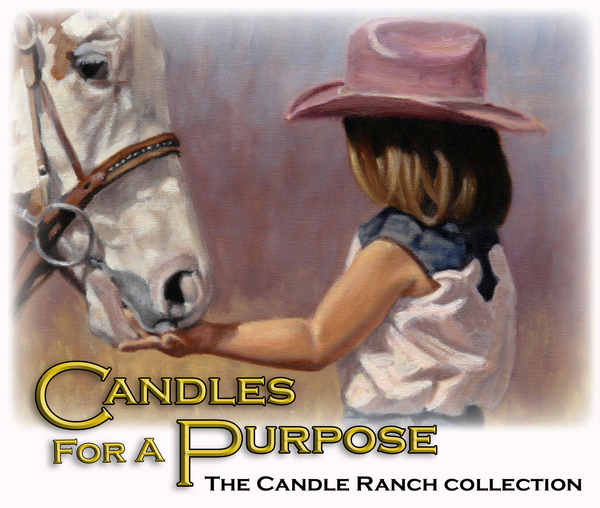 Each candle is hand poured, each wick is individually hand set, and each fragrance is specially formulated to provide a lasting, exclusive fragrance that only The Candle Ranch can provide. Experience the amazing scents and purchase your candle today! For award winning singer/songwriter Homer Joy, "Success is in the journey and not in the destination". A dedicated performer who has been called a "Country Music Legend" for his songwriting credits, Homer's passion for music is felt by every fan that has been witness to how special he is on stage. His professionalism and attention to detail makes Homer Joy one the premier performers of any era. Long before his song "Streets of Bakersfield" became a Billboard #1 hit for his longtime friend Buck Owens and Dwight Yoakam, Homer released the song and many others as a recording artist on Capitol Records. His personal battles and professional triumphs have given him the resolve to bring true country music the way it was meant to be played back to the world. With a stage career that now spans four decades, he continues to show that the Bakersfield Sound is still going strong. Homer Joy and the Okie Road Band have a musical medley of Country, Rockabilly and a touch of Blues from his legendary original catalog of songs, plus a collection of some of the greatest cover tunes that fans of all ages will love to hear. Each show brings a new adventure for the audience, creating smiles and cheers from music lovers in all walks of life. Listen to songs from his latest album "Someday It'll Be Country". It includes the duet "John Law" with Homer's longtime friend Buck Owens and some new tunes that have received rave reviews from around the world. Don't miss his video's, photos, biography and a list of credits that few in the music industry have enjoyed.